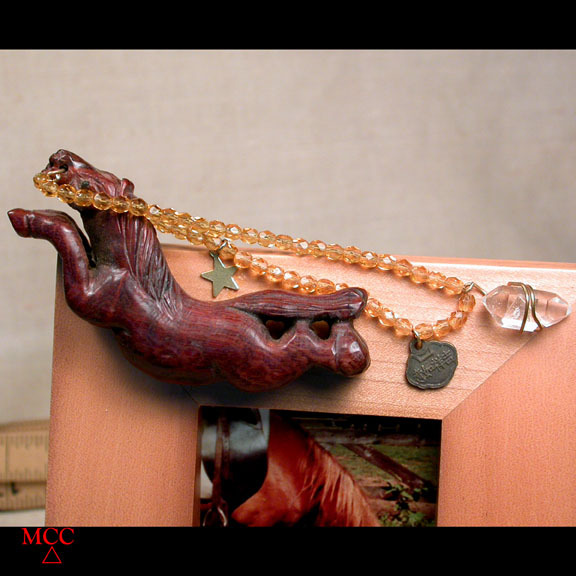 Golden bit in his mouth, flying across the sky, a hand carved Mali wood horse has glittering reins - bringing you a gold star, double good luck bronze coin, and a shining rock crystal. Exquisite A+ Arkansas doubly-terminated rock crystal has an uncommon extra facet at one end - called a 7h face to the future. It's got a growth crater lined with sparkling micro crystals, too! We've wirewrapped it to facetted golden topaz facetted Swarovski glass crystals, the color of success and achievment. Each time you or your giftee need energy, good wishes, a bit of sunshine, here is this 5x 6-1/4" high hand made light maple frame to bring it to you! 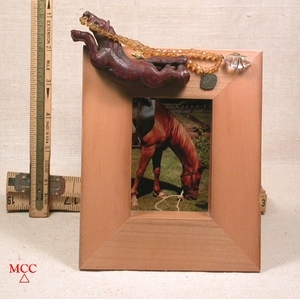 Resting on a wedge base, it will hold your favorite 2 1/4x 3 1/8" inspiration.